This rather funny-sounding word has an important meaning in Italian. It denotes those who live (and perhaps were born) elsewhere, but have their roots (so to speak) in Italy. This may apply to those who have two parents from Italy, or perhaps just one grandparent who was born there. If you think of yourself, or if others perceive you, as being of Italian origin, when you are in Italy they will consider you oriundo. Italians place a high value on "blood" (ethnic identity) or jus sanguinis. So you may well be considered oriundo even if only one parent was born there, or even one grandparent, especially if it was your paternal grandfather- so that you have the Italian surname. 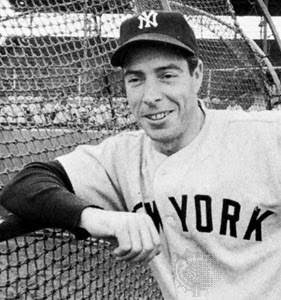 Il grande giocatore di baseball Joe DiMaggio era oriundo. Era nato in California, ma i suoi genitori erano siciliani. The great baseball player Joe DiMaggio was oriundo. He was born in California, but his parents were Sicilian. La famosa cantante americana Madonna e' oriunda. The famous American singer Madonna is oriunda. Many Argentinians are of Italian origin.